I had selected my pin for the pinterest challenge & started early this month ! But like the proverbial hare, I happily took a short break. Then came 2 unexpected but very exciting & absorbing projects, and this hare couldn’t get back on the original track. Needed to find a “shortcut” ! 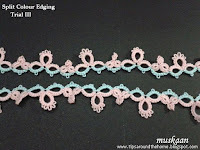 Thus under-PINning undermining my resolve to not include tatting, this month’s post is all about that : my very First tatted edging , with pattern & possible variations …. My brief was to tat “a simple edging in size 20” for a handkerchief set that my MIL wanted to gift her friend. 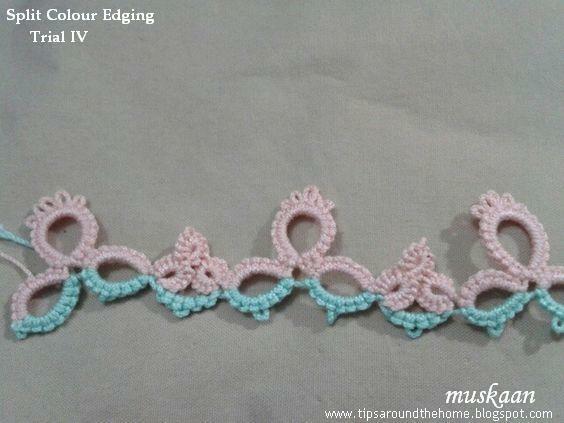 My MIL was tatting one edging herself (she learned to tat at the age of 50 & had made lots of simple edgings during that phase). But simple ring & chain was boring & I took the opportunity to design my own edging !!! that can be doubled back in various ways for other applications. TRACK I : Made a few sketches, & chose to tat this pattern, using threads left on the shuttles. TRACK II : Chose the final colours & added a double picot to raise the flat line between 2 trefoils. But colours seemed too dark for the hanky & picots would be difficult to control when the hanky was washed; they would require blocking each time. Not practical. TRACK III : Hmm, a Josephine ring cluster could raise the height and complement the trefoil – like little buds perhaps ? Here, the trefoil rings are not joined together. Started JR cluster with a loop tatted JR over the left JR (LTROR method) – looked good. Then switched to SCMR method only because it so much quicker to tat. But, the top JR in the cluster kept twisting. Wasn’t totally happy, & tried a couple of tweaks midways, but continued tatting. Until finally, I just couldn’t go on & needed to re-think. After all, this edging was going to be gifted …. TRACK IV : Joined the trefoil rings ; increased center ring by 1 ds on either side ; made requisite changes to the JR cluster. Yes, the floating JR stayed in place ! Also realized that the floating JR needs to be started as close to the SCMR as possible, for it to stay afloat properly. But 2ds increase messed up the proportions. Finally stopped again. TRACK V (the final version) : Back on track & tatting full speed ahead …. See the threads still wound to the bobbins? I intend to use these discarded lengths in some of the following ways …. Back on Track or backtracking? The motif is 1¼” high & ¾” wide, tatted in size 40 green, & 2 strands of variegated pink silk thread. 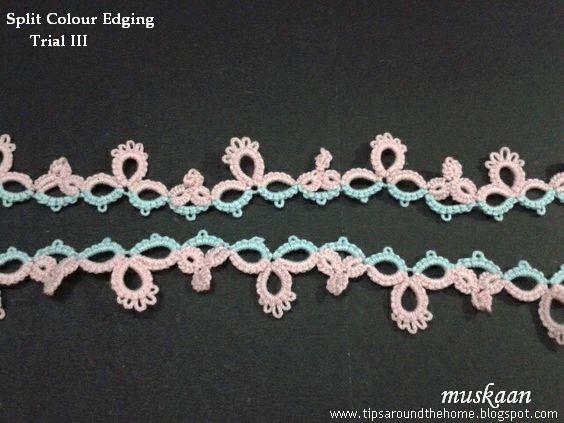 The edging is slightly over ½” wide & 3 repeats (of trefoils & JR clusters) are 4" long. A total of 32 repeats were required for a length of a little over 1m or 40" approx. It is made of alternating trefoil & Josephine ring cluster. Each trefoil has 2 split rings at base & a normal ring with graduated picots in center. Each JR cluster starts with a self closing mock ring (worked as a JR), with a thrown JR on top. The SCM(J)R, after completion, is followed by a short chain & then a normal JR. It is a very quick tat, if we know the techniques. 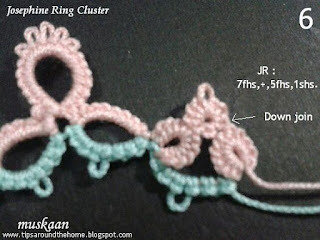 A quick pictorial on how to tat the Josephine Ring Cluster …. 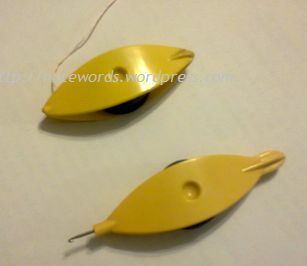 TIP : Make the half stitches 'lose' so that the Josephine rings look & function better. Step 2 is very important in order for the ring to lie flat later. Do not leave any space/bare thread between the mock ring & the top JR. TIP : I ended each JR with a shs, which I don’t normally do. In this case it seemed to reduce the twisting of the JRs, allowing them to lie flat. I tatted the short chain with unflipped/reverse stitches (direct tatting), thus avoiding reverse work (RW) totally. Although one can RW & tat the chain normally, it would be very good practice to try out direct tatting, especially since one is already familiar with split ring & the same technique needs to be applied to a chain setting. One can add a half stitch at either end of the chain, if desired. I liked the slight layered look. 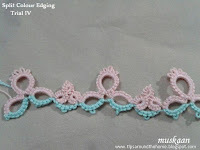 TIP : Use Down join if Josephine ring is made with 1st half stitches (fhs) because it imitates the fhs. Use a normal Up join if JR made with 2nd half stitch (shs). The 3-page pattern pdf contains the diagram, written pattern, and the JR cluster pictorial (without text). from "24 Snowflakes in Tatting "
My little experiments are creeping along – trying to apply different techniques to a regular symmetrical pattern …. I visualized this snowflake as a cross section of a tree trunk with a flowering creeper around it . This determined my choice & placement of colours. I started with a normal ring, mock picot, followed by SSSRs. After each SSSR, I made a lock join on the picot to secure & move into position for next ring. Last ring is again a normal/regular ring, with picot join to first ring. Thoughts : the lock join may show up in lighter shades. The shape of SSSRs did not come out as evenly as I’d hoped, but that is perhaps because of my own limitations of thread size & eye sight when working tiny fiddly rings. 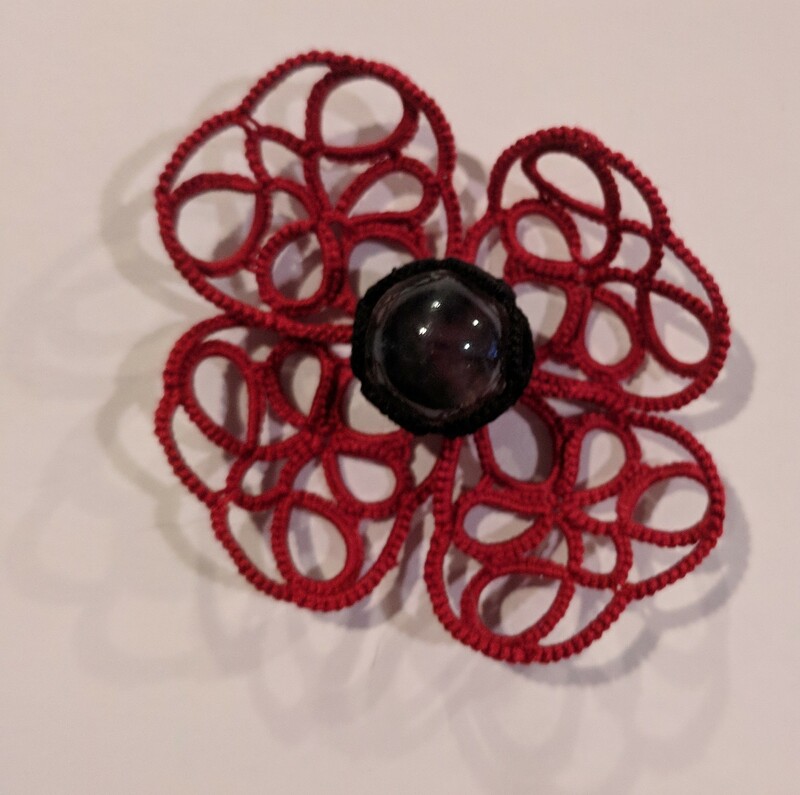 Round 2: 2 shuttles, directional tatting (fs/bs or RODS), mock rings, scroll, rotate work, direct tatting (reverse stitch/unflipped), very small picots, fold chain (2 first half st or 2 second half st). Visualizing this round as flowers in profile on a climber with leaves, I wanted to add a bit of layering effect . Hence used the running scroll & mock rings for the green stem & leaves part. The pattern called for a figure “8”, not just a single ring-and-chain scroll, as well as anchoring to chain. Another catch was that despite the spiraling ‘8’, all stitches needed to face outwards as in normal rings! I tried a couple of different ways to get the layered scroll with mock rings on both sides. 1. Folded Chain using 2 half stitches before & after the outer ring in order to get the ‘8’. Made 4 in this manner, first without joining the chain back on itself, then making a very small picot & joining back as a mock ring. 2. 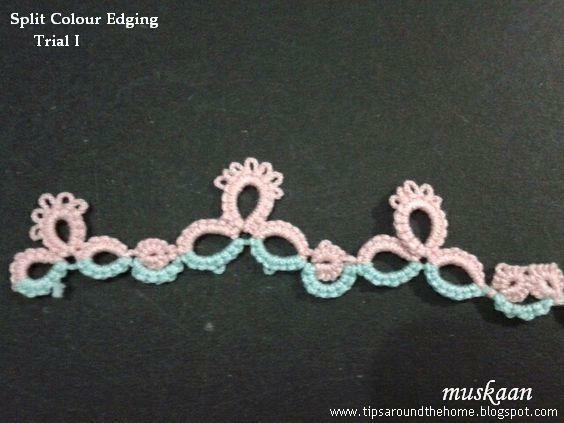 Direct Tatting was used in last 2 repeats. Switch to reverse stitch (unflipped) when change of direction is needed. Because the green is a continuous chain, adding & joining of picots was adjusted according to the flow of the chain. Thoughts : Getting the scroll & joins right was a bit of a struggle! 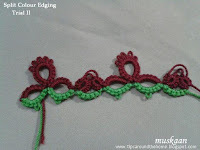 At times I even messed up my directional tatting. Method 1 with folded chain creates a lot of bulk underneath, with 2 twists ! However, it can be worked with single shuttle & ball, if required in any pattern. What also complicated matters was the fact that the leaves were anchored at their end picots ! I don’t know how I crept out of that one ! Super 17 butterfly & Morning Glory on the doily in above pic. A super quick round ! Used ball & shuttle this time. Happy with my long chains. It was only while blocking (I still use the rolling pin) that I noticed one chain had twisted. Oh well, got to live with it. Measures 13¼” after this round , in size 40 thread. This pic is taken with the doily draped over the dining room chair. Lighting is not too good, but the background is maroon. A super quick round ! Used ball & shuttle this time. Happy with my long chains. It was only while blocking (I still use the rolling pin method) that I noticed one chain had twisted. Oh well, got to live with it. I’ve started Round 13 & it looks really pretty !!! You are well aware that if it wasn’t for Robin’s Inkscape tutorial series , I would probably never have learnt to use this program. 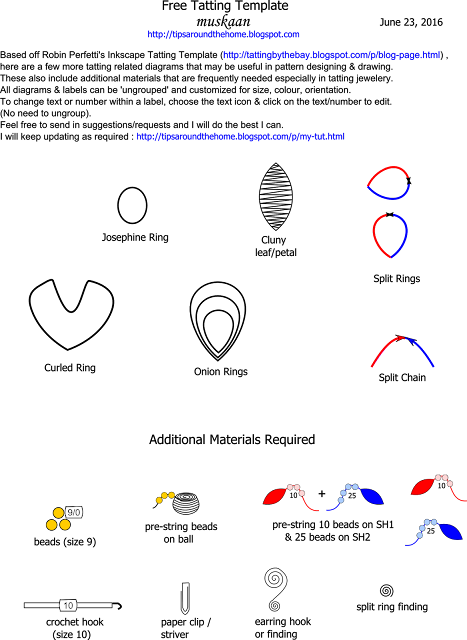 She also graciously shared free templates for tatting, which I have often used/adapted in my diagrams since. Recently, she uploaded a few more graphics inspired by Ninetta's drawings. I am currently working on a diagram & pattern, & needed many more basic diagrams to make it more visual & less textual. All diagrams can be un-grouped to re-size, modify or customize . All text can be changed without resorting to ungrouping, by simply selecting the text icon (‘A’) on left panel of Inkscape & then clicking on the text that needs editing. Feel free to use as desired, and send in suggestions/requests for more diagrams. I will try to draw them to the best of my skills, then update the file on my Tutorials page (hence the date, to keep track of later versions). …. where a simple doily round leads to musings & experimentation on rings and when to post a shuttle. Another very easy, leisurely round. I was scared of messing up the alternate floating/thrown rings – one with decorative picots, one with single small picot. But frequent checking kept me on the right path, phew. There is one thing that has me flummoxed for a long time : the directionally tatted (frontside/backside or RODS) rings don’t close as flat as normal rings. Off & on I had experimented with many different tweaks but nothing seemed to work. I took this opportunity, to experiment further. The rings were small and a botched experiment would not be too visible. I was surprised at the trial result, and happy to have found a solution that works for me. And in my usual way, I didn’t stop at that. My curiosity to see how different ways of tatting & closing rings compare with each other led to this small experimentation below. The model is accompanied by a table with all details. This may not be ‘original’, but it is part of my own learning process to make my tatting better. Dear tatters, what is the secret to Your perfect rings ???? R – ring ; FR – floating/thrown ring ; DS – double stitch ; RODS – reverse order DS ; fs/bs – frontside/backside ; fhs – first half stitch ; shs – second half stitch ; post shuttle – pass shuttle through ring from front to back before closing ring ; . – close ring ; – – picot. Base of ring at closure – in the images, point of closure of each ring lies on the right. Does the core thread emerge from ‘front’ or from ‘back’ – after shs, core thread emerges from the front ; after fhs, it lies behind. Size of the ring – perhaps there is a difference when closing small versus large ring ? 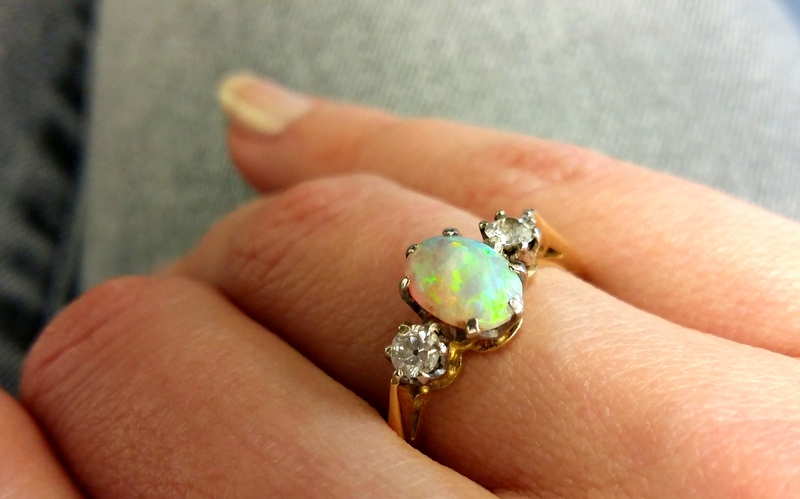 Desired shape of ring – tear drop or rounded. Pink rings are thrown/floating rings. Reverse Work before & after each lower ring. For a long time now, I had been following Frivole’s tip in Ring 4 of adding an extra shs before closing ring, when working from the front. In the latter half of Round 11, where the rings were 4-4, and worked from the back (after reversing work), an extra shs and posting shuttle (as in Ring 9 above) seemed to work, making me happy. In these 'larger' directional rings, before closing, I added a 1st half stitch and posted the shuttle. They lie so much better than the first one on left which was extra 2nd half stitch and post shuttle ! I'm not sure whether size of ring is the reason ... that will require more trials to determine. Let's just say that we have many options to choose from as the situation demands. What I also noticed is that the ring tends to remain slightly open, & requires one final tug to close it completely. Perhaps this is also the reason why I can open the ring much more smoothly in case of retro-tatting. When to post shuttle ? I first learned about posting a shuttle through a ring on InTatters & when I tried it (then & later, too), it didn’t work for me. Don’t know why some things just take a long time to ‘click’ ! Although it hadn’t worked in regular tatting, I did find many applications where it is required – whether posting the same shuttle, the 2nd shuttle, or even multiple shuttles ; whether posting through an unclosed ring or through other elements or a loop. Interlocking Rings using shuttle – clearly, without posting the shuttle through the previous ring (before it is closed), there will be no interlocking of rings, whichever method one adopts for the latter effect. Interlaced Split Rings – In this 4-shuttle braid, the one shuttle from the 2nd pair is posted through the open split ring of 1st pair, in order to interlace adjoining rings. Teri Dusenbury's SQDR (split quadruple directional rings) which are rings thrown off a split ring. These thrown/floating rings twist if shuttle is not posted. Arrow points to the yellow ring where I forgot to post the shuttle. Freeform – when the 2nd shuttle or ball is posted through the unclosed ring, the next element (chain or ring) overlaps or is enclosed by the first ring, slightly. Cluny Tatting – one small step behind the scenes, especially for multi-Warp tallies, requires the loom shuttle to be passed/posted through the horizontal bars at back. This step allows for easy closing of each Warp , when tally is closed. Ninetta's small Curled Rings or Alternate Methods of Curling Rings – requires the other shuttle to be posted through the ring such that it gets encapsulated within the joining picot. Ninetta’s Tiny Tatted Beads – In her 3-shuttle pattern, she posts 2 shuttles through the tiny ring, creating a cute beaded effect. Celtic Tatting often requires a shuttle to be posted through elements. Directional rings - for neater, flatter rings, as demonstrated in experiment above. Interlocking Split Ring Braid – consists of a continuous braid of split rings interlocked together in a row. Made with 4 shuttles, it requires posting one pair of shuttles through the unclosed SR of 2nd pair & so on. Also check out this chainmail-type braid by Ninetta made with only 2 shuttles and her pictorial showing 3 methods here. 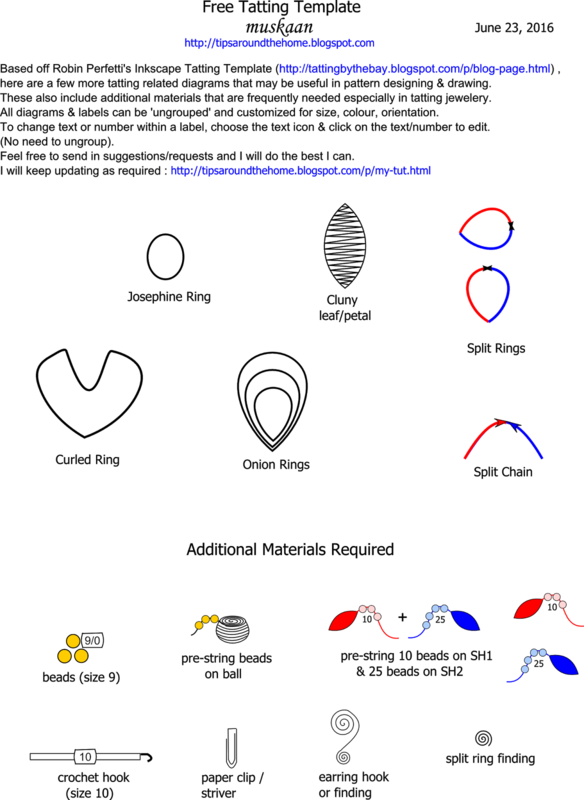 Overlapping Picots in rings – in order for the layered picots to become intertwined & overlap through adjacent picots, posting shuttle is required. While 'posting a shuttle' usually refers to dropping it through a closing ring, in a sense the movement is performed when encapsulating the other shuttle thread in most joins such as CWJ, LHP, S2LHP, etc. or perhaps SCMR & LTROR when shuttle is 'posted' through a loop.